Your brain power is needed! Please add your comments on the pros and cons of owning an RV. Should we buy an RV? With all the moving around we are doing after selling our house most people are surprised that we don’t have some kind of RV. But we don’t. At least not yet. The idea of an RV is tempting though. Not so tempting is the COST! Realistically we would be spending some of the money we have set aside for buying our next home. I keep trying to weigh the pros and cons but I have never owned an RV before so I am just guessing. Here are some of my thoughts but PLEASE leave your experience, suggestions, thoughts, Pros and Cons. Maybe you even think one of my ‘cons’ should be a pro…tell me why. ← Pride or regret; which would you feel if a horse you raised went on to success after being sold? Great photos of the best layouts for Wildwood Travel Trailers. These trailers are luxury and comfort at it’s best that you’ll think you never left home.The idea of an RV is tempting though. Not so tempting is the COST! Realistically we would be spending some of the money we have set aside for buying our next home. Great photos of the best layouts for Wildwood Travel Trailers. These trailers are luxury and comfort at it’s best that you’ll think you never left home. NO, NO you will be sorry if you have to have one go rent it for your trip. Get a heavy duty truck and trailer with living quarters. RV’s cost lots of money and you can’t resale it after the thrill is gone. Rvs are all the pros you have listed and the cons aren’t that big of a deal. I will agree that my husband handles the tanks! :). Low gas mileage, yes but you drive a truck I’m sure so you are used to it. Small space- no biggie. Everyone finds a space and you’ll be fine. We bought an RV a few years back and love it! Try it. Maybe buy an older one that you can learn on and if you love it trade it in for a bigger one. If you hate it – they aren’t terribly hard to sell and they hold their value pretty well. My final thought is a big truck (F-350 ish) with a really nice gooseneck horse trailer with great living quarters. You have a home, a place for horses, transportation and so on. all reasons stated already by others. save your money for what your real living dream/goal is–which sounds like a ranch in a place you love. If you are going to cross any mountains, like the Rockies, knowing suitable routes takes research because the steepness of the pass and your load weight make a huge difference. Talk with others who have travelled and know the science of load weights. It also takes steel nerves to drive in the mountains w RV pulling horse trailer in some of those situations. We have a 33′ RV and a large 4 horse trailer and it is awesome. We can camp almost anywhere with the smaller size. In the first stall of the horse trailer we put our street legal dirt bike so we can drive around and run errands when camping or traveling. Ours is a diesel pusher and gets about 9-11 MPG while towing. It does better than our Dodge 3500. Instead of traveling on a plane with our family to an exotic places we use that money and time to camp nationally with the horses in the RV. You do have to make sure you use it otherwise it is a luxury expense. So renting might be a way to ease your way into it and to see if you really like it. It’s your home away from home. Some rvs have washers & dryers! RV camps have laundry mats, showers, places for the dirty water etc. I’m in the RV camp. Trying to get my old man to get one. Shoot, think of the Grand Canyon with the horses! I have read most all of the replies and there is a wealth of knowledge in them….now just what to do with it all! We have been camping (in ALL different forms) for over 40 years now. We have gone from roughing it in tents, pop ups, self contained campers, all the way up to our last camper was a 36′ 5th wheel with triple slide outs (even had a fireplace in it – great for those chilly days!). We loved that camper, but found that a lot of the more remote areas we wanted to try out, were just too hard to manuever with that big of a rig. Now add a horse trailer behind it… no way! Every state’s regulations on licensing, weight limit, tow length, etc. are different… gotta do your homework first! Research everything…. But my 1st suggestion would be to rent a camper…. then rent a 5th wheel, and finally rent a motorhome… See which fits you the best for your road tripping purposes. We usually tried to either stay at state parks, US Corps of Engineer’s Parks, or Good Sam, KOA Kampgrounds, etc. But each have their restrictions and some do not allow horses, so check first…. As far as maintenance, campers are just like cars, trucks, even houses. They all need some maintenance once in a while! With the 5 campers we had, however, we never had a major maintenance issue. On this last unit we did take out the roadside insurance, just to be safe with such a big investment. And it transferred to the new owners when we sold it. I highly would recommend the roadside insurance, it was peace of mind for us on the long trips! Yes you don’t get very good gas mileage from either campers or motorhomes, but there has to be a sacrifice somewhere. We just bit the bullet each time and prayed for cheap gas prices along the way! Some of the units now have washers, dryers, dishwashers, trash compactors, etc. in them! I loved our fireplace which doubled as a space heater when needed. Then, if you decide to purchase one, check on Craig’s List. We sold our camper & truck as a unit on there and got more than we ever figured we would get out of them! And vice versa, you can get some good deals on there. But I would suggest if you find one on Craig’s List, have it checked out by a local RV company for being sound, before signing on the dotted line. I love camping and really miss that right now we are not able to do much of it. Hoping that this is just a short, temporary setback and we will soon be on the road camping again! But plan to get a bit smaller unit next time, since all the grandkids are now getting too big (and are in school full time now!) to go along with us as much of the time. Good luck in whatever you decide. An RV is a major decision to purchase, one to think over and ponder on…. but by making your pros & cons list, you made the first step. You are processing your options. Check with RV parks, talk to people — trust me, they LOVE to talk camping!!! Talk to Park Personnel and get their ideas, send for state park camping guides from the states you will be travelling through, talk to several RV dealers…. they will try to sell you on “THEIR” brand, but just listen…. and decipher which type and model most suit your needs. 1st and foremost, I have to say I love your blog, comments and videos! Keep them coming. I don’t know how you find the time though. Put your con word MAINTENANCE in big letters. Now make those letters bigger yet. Maintenance and the time involved to repair can make your trip(s) costly and miserable. It’s not a basic car/truck where you can pull into a place and get things reasonably fixed. Work has to be done outside verses on maybe a lift in the shop. As it’s being repaired, where to you live? A motel? Just go there in the first place. A break down on the road? Hauling cost? How do you take your horses with you? Another vehicle? More cost. RV depreciation… more $. They never appreciation like a home or land will. Save your $ for those. I tune in every day to see what’s going on..
Lots of good ideas. I like the idea of renting a unit first. When you get back to Strasburg, check out General RV. They have rentals there. But since you have a large horse trailer, I doubt if you could tow it with a motor home. 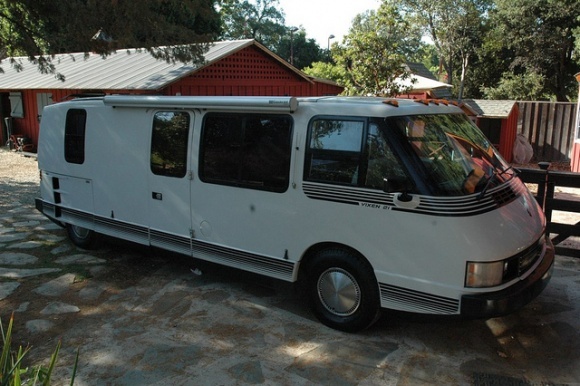 Most RV’s for a family of 4 or 5 people will be 40 foot long. Imagine towing a 30 foot trailer behind it and needing fuel. The option of owning a 40 diesel pusher is out of the question because of the cost and overall maintenance. Gas units have no value and you can pick one up very cheap. But they lack power and get horrible mileage and just don’t last. That is why you don’t pull a 6 horse trailer with a gas powered pickup. We recently bought a 40 foot Toy trailer with a gooseneck. It has 3 slide outs, full size refrig, and full size shower. Easily sleeps 5 or more. Full size kitchen. It has a 12 foot section in the back with a fire door for your toys. Has a washer and dryer and fuel station for the toys outside. Can be towed with a three quarter ton truck (diesel). The down side of this setup is what other people said in earlier comments. You will need 2 trucks, 1 for the horse trailer and 1 for the toy trailer. Our trailer is a KZ Escalade, toy trailer. If you google that name they have pictures of the interiors, which will surprise you. Also, if you buy a used one and need parts, never go to a dealer. There is a company in Michigan that buys discontinued parts from all the trailer manufacturers for pennies on the dollar and sells them cheap. Can’t remember the name right now, but we picked up a Norcold full size double door stainless steel frig. that operates on 12v, gas and 120v for $610. Dealer wanted $3600. I would think renting one would be a good idea as well, if allowed to rent and pull a trailer. However, make sure you check all of the state laws regarding what license you are supposed to have. I know here in California, if you have a heavy enough rig, you’re required to have a non-commercial Class A license. It wouldn’t be fun to add on ticket expenses. You are making it work as is. I think you should save your money. The conveniance is not worth the money. There can be a lot of inconveniace also. When it’s snowing I would be very grateful to pull up at a barn for the horses and a cozy little cabin. You could throw the ice-box, swags/bedding and a couple of horses in your trailer and have a real camping trip any time. You should rent or lease one for a month before you buy. Talk to the Professionals on what you’re wanting it for…family travel only, family and pulling horse trailer, finding campground that allows horses, etc. You would still want a car/truck because if camping, do you want to break camp just to run to the store? Capacity and living space: The tanks in “toy hauler” trailers have a lot more capacity than a motor home or plush fifth wheel RV. If you get a toy hauler and are fitting 5 people in it, I would suggest 3 slides, no less than 2. You will have two trucks, one to pull the RV and one to pull the horse trailer. It is possible to live for an extended period in a toy hauler, but you may need a storage unit or storage shed wherever you are staying. Weight and towing ability: A motor home could pull your horse trailer, but check the weight and towing capacity carefully on whatever you buy and make sure your vehicles can handle what you are asking them to do. If you choose to start living in the RV, or making extended trips with lots of items, this adds weight that must be taken into consideration. Best of luck in your decision! PS: Most motorhome rental outfits will not allow you to pull a horse trailer. If you are thinking of renting, you may want to check that out first. Don’t forget gas cost and consumption . . . Not that I have a vote but I’m yelling NO. Don’t ever listen to anyone who says “You can camp wherever you want.” A LOT (most) standard camping areas do not allow horses. Period. If you are at a show, it is great, especially if you are like me, and really like to eat your own food, when you want, and stay out of the restaurants. Also, if you are at a horse show, there is water, which is a MAJOR concern camping with horses. You simply cannot pack enough water for 3 or 4 horses, for a few days to a week. One gallon is about 10lbs. X say, 15 gallons per horse per day, X 3 horses, X 5 days. It adds up to a tremendous amount of weight and volume. Also, many areas when you might be able to stay require you to pack out your own manure. Having said all that, (big breath) I LOVE camping with horses. We have a 1 ton Dodge diesel, which I think is about the best vehicle on the road for pulling, with a 10 foot camper, pulling a 4 horse extra large extra tall Cimmarron bumper pull. There are some really nice Motorhomes around that would be nice, but they won’t get into the places where we want to go (remote camps). If I was living what I perceive your lifestyle is, a motorhome is really the only option, but they are a huge expense, with very poor resale value. The cost of repairs can be astronomical, therefore it is almost a ‘need be’ to buy one that is still on factory warranty. My last point is regarding the holding tanks. If you are in a camp ground where you can hook-up to their sewer and water system, it is fine…but as far as travelling, you are looking at a lot of sponge baths, and going without a good shower and shampoo, because you will use up all your water and sewer capacity in not a lot of time. In my mind, an RV is just that, a RECREATION vehicle, and does not replace a home (especially when you have horses!! ), but having said that, if you are travelling with two outfits, a pull along travel trailer can be very very nice for stops along the way, lunches, or the occasional 3 day weekend in the woods! Good luck!! If you want to PM me about brands to stay away from, feel free. I have been doing this all my life! Owned and Motor Home for the past 15 years and loved it. My parents owned one so we grew up using one for camping, fishing trips, Disney world, you name it. My best memories of my childhood were trips in the motor home. My best years with my grandchildren were in the motorhome. Staying at horseshows, or driving down the highway and baking cookies at the same time, while the kids watched tv and fell asleep. Can’t say enough about how many great years we had. I did find out that most of my friends that bought motor homes and didn’t use them bought too big. They were difficult to drive, park and get into gas stations. Just a little intimidating. I stayed at 28ft and can handle it like a van. No problem parking or getting into situations I couldn’t get out of. I think you should do it!!! They only way you will ever know. If economy is the word than rent a cottage or room where ever you go. Justifying the cost of an RV is difficult if your not using it constantly for the life of the vehicle. Those RV can cost as much as a small home. However, if economy is not an issue, then go for it. Stacey, first figure out how much of the funds you are holding back for your house you can justify spending. Second, once you have a figure, start researching the cost of renting to try it out. Compare that to buying used in good mechanical shape. The interior does not have to be beautiful, but it should be sound. This will allow you to decorate the way you want it. My husband and I went from a small farm to being permanent campers and we selected a park model which is very roomy but it is not one that you would pull around much. We made it through an Ohio winter quite comfortably. Check in at a local campground and talk to some of the permanent campers they are a wealth of information. You do know what RV stands for don’t you? Ruined Vacation (from my local RV fix it Man!) LOL Best Wishes! One negative thing a about RV’s is that they are generally not good on gas mileage. We own a 38 foot diesel pusher and it still only gets about 10 miles to the gallon. One pro is that if you have a generator, you can camp just about anywhere and still have power. It also will give you space to move about while traveling, allow you to eat out less , and eliminate some of those rest area stops. It is a very good way to travel about with a family that way. Stacy, We bought our first 5th wheel gooseneck RV last year (28ft). We’ve not ever had one. With both of us retired, hubby thought if he could dynamite my fanny outta the house & away from the critters, we could have fun. Well, we just returned from a 3 week stay in Idaho. We had a ball. The size is not “your” house, but we adjusted. It can be cramped, but if that be the case, put the kids (?) in a tent beside the rig (we saw a lot of that). If you’re used to pulling a goose, there’s little difference, same holds true with a bumper pull. We horse girls/women don’t think twice about maneuvering horse trailers, RV’s are not much different, just a big bigger. You’ll have the same problem with fuel, with no “ribbons” to go with it. We did mostly rv parks, rv resorts. There was a campground in Oregon we wanted to do, but the parking/hook-ups were misplaced which made things interesting and other folks would just park their trucks on the byways without consideration for other rigs trying to get through. There are restrictions on length in many places, and on a few roads with tight switchbacks. Make sure if a goose/5th wheel is what you’re looking at, make sure you get the 5th wheel hook up (so you clear the bed sides on your turns) and have the extended bed on your truck so you can tuck. After those 3 weeks, I wouldn’t trade my 5th wheel for anything. ———- if hauling your horses along with these trips is your goal, get a horse trailer with sleeping quarters/kitchen and the likes….. and make sure someone in there has a class 1 for those types of lengths. To RV or Not To RV…that is the question. The answer is convoluted, tricky and will vary widely from person to person. (Wow. Can you tell I’m in marketing?!) That being said, for horse people I think it’s quite different than for “normal” vacationers, since of course we also have to haul a horse trailer. CON: My parents’ RV, when hauling a full 4-horse stock-type Featherlite trailer, gets about 55 yards to the gallon. Okay, I’m exaggerating. But seriously, it’s 5 miles. To. the. gallon. FIVE. Yikes. So, whenever we go on our “Out West” horseback trips, the RV rarely gets to go unless a) it’s a trip under 8 hours AND b) someone else hauls our horses. PRO: That being said, when we do short trips — couple hours away — the motorhome pulls the trailer and it’s great. We’ve got our own bathroom, room to sleep up to 5 people, oven/microwave/fridge, shower and — sometimes the most important — heat. CON: BUT, that also means we don’t have a separate “run-around” vehicle. Of course, on those trips all we’re doing is trail riding and there’s no need to drive anywhere else (PRO). I also agree with renting one first — try it on for size (and get your checkbook used to the idea :). I feel as though I’m not helping…it seriously comes down to what you want to do with the RV, where you’re going with it, how often you’re driving/using it, and it all boils down to cost (IMO). RV life was a necessity for my family when we lost our home. We lived in a 1974 24-ft Winnebago for 13 years FULL TIME. I raised a teenager and a baby at the same time. We parked and had a second truck for going to groceries, work and laundrymat. Horses were boarded at the rodeo grounds about a mile from where we parked the motorhome. Not easy but we managed. I even had a black Labrador that slept in the hallway and to get in the bathroom you had to gently push his head down and lay him on his side, don’t even think about closing the door for privacy! I wouldn’t go back to it for anything now but it made me a stronger person doing the RV life. I agree with other’s comments, if you can rent one to try it, do so for a month not just a couple of days. Let the newness of the adventure wear off the kids and the reality set in! However-after the fact, once you get settled, you would probably still use it for shows, etc. They are pretty nice, and yes, the slide outs make s HUGE difference. Most do not have dishwashers, altho they probably are available. I miss that and a REAL oven. Also make sure you get a larger fridge. We have a nearly full size side by side and it really makes a difference. You will need to figure out TV service, roadside assistance other that AAA, internet. Pumping is not difficult, just make sure you get some of the books that tell you what is at each exit so that you have resources should you have an issue. Renting is a good idea to see if you like it. They are a huge investment and not easy to sell if you change your mind. Good luck Stacy- Feel free to ask questions…..Happy to help. How long will it be until you buy a home? RV living is fun short term….so my suggestion is: 1. Get settled on your ranch. 2.Then buy an RV that you can afford. Your permanent home should take priority over a luxury item(RV). Financial stress ain’t good for marriages, health or investment opportunities. Think about that great deal you could miss when a dream ranch comes up for sale and you don’t have the bucks. I certainly don’t want to be a spoil sport but you asked for my opinion. I love your free spirit. Totally agree with you James. Also, I would highly recommend a travel trailer and not a motor coach. Much cheaper in the long run. I would not hesitate to buy something used as long as its been thoroughly inspected. It is much more expensive to replace or repair things like appliances. Good advice. RV’s (and tight space) are great fun when it’s not the only place you have to live. 5th wheels are much easier to pull. Haul without filling your water tank unless you know you will be in areas that you cannot hook up to facilities. Go on a couple of shake-down cruises before you go for any long hauls. You’ll find out quickly what you didn’t need – and what you did! The BIG con is gas prices. Crazy high. My sister and her husband have a large RV (35 ft I think) that they pull a horse trailer with. Definitely VERY long with the trailer attached and not easily parked without lots of practice. I recently came across this though: http://www.equineequipped.com/ and thought it would be much more convenient because you could just unhook the truck when you needed to go somewhere and you would have the convenience of a full sized 5th wheel. I have never see the ‘toy hauler’ used with horses! I love the photo of the horse beside the golf cart, lol. This is brilliant, thank you for this wonderful share Mrs. Fong! There are two types of RV. The travel trailer type and the motor coach type. They both have their own pros and cons. The travel trailer type can be dropped and you can drive the truck to run errands etc. They don’t require their own insurance, the registration is cheaper, maintenance is cheaper and you can still use the truck you’ve already made comfortable. On the other hand, you can’t go back and make a sandwich while your spouse is driving, you can’t also tow a horse trailer, and your vehicle becomes even longer on the road. The motor coach may be able to tow a horse trailer ( or even a vehicle to drive), you can take a nap or make a sandwich while going down the road, you dogs can still see you while they nap on the sofa, getting up rough dirt roads is much easier and your total overall length is often shorter which makes cornering and parking MUCH easier. The downside of a motor coach is that it requires it’s own registration, insurance etc. It has it’s own engine, transmission etc which means it needs oil changes, spark plugs etc. Neither type will get good fuel economy and both will take up a lot of space when you are not on the road. Stopping anywhere you want is not always true. Some camping sites do not allow vehicles over so many feet. Cost of a gas will be a big thing. When you have to go somewhere say the store you have to drive the RV, parking can be a pain. You will have to beef up a hitch for it. Rent one for awhile was a very good suggestion. Plan a trip that will really show you what RV camping is. AS for small living space. Some of the New RV with all the slide outs make for nice leaving space. RV living will be a life style change. Don’t waste TP. Use as little waste as possible, and only pack what you need. Are just a few. Do your research. Remember if you are pulling your trailer total length some state have restriction on length. My just is with Rv & trailer you will be over 55 ft. Good luck and enjoy your research. Love having a home on wheels, but yes you would still want to drive 2 vehicles, or buy a motor bike to put on the back of the motor home. It is not convenient to have to pack up the motor home for a trip to the store. As far as the holding tank, they do hold quite a bit, the grey and black water are seperate tanks, and you can empty at most rest stops. If you are parked somewhere for some time hopefully they have a hook up for you, if so, no worries about the size of the tank. They do make motor homes with washers and dryers also 😉 the stackable type. I currently work on the road in the oil & gas industry. Since 2010 I have lived full time in a RV. My suggestion would be to possibly rent one. If you go with a self contained Motor home remember you might need to tow a get around vehicle unless you are pulling the trailer with another vehicle. My fifth wheel trailer has a washer and dryer in it. I personally would not own one that does not. I am currently having a horse trailer with living quarters built as I need to haul my Jeep instead of towing it behind the fifth wheel. It is going to have 1 slide instead of the 3 that my fifth wheel does now but will still have a washer & dryer in it. This way when I get my horses back and do not feel I need to work 12 months out of the year I can haul to different campgrounds and trail ride from a camp base. Your pros are all great, cleaning tanks isn’t so bad but leave it for the boys. One question would be-are you looking at a trailer with living quarters (be able to use current tow vehicle) or are you looking at motorhomes? If a motorhome you must have a tow behind horse trailer and will have to get a motorhome with a beefy motor to tow the trailer loaded. Just a few more thoughts for you. Cost you thousands to replace. Unless you have a second vehicle, every time you want to go somewhere you have to disconnect the motor home and make certain everything in it is secure before you drive away. We have tried several different types of RV and each one comes with its own advantages and disadvantages. Expensive for gas or diesel. Okay if you park at a place for a week or two. Still have to tow horse trailer and buy fuel for truck. Seems like two vehicles and two drivers? maybe you should rent one for awhile….. a couple of weeks should help you make up your mind…. good luck!! or maybe one of your sponsors Weaver Leather or Tekonsha would get ya one!!!!! ya think?? Some have “stacked washer and dryer combo” that is a big help. And you can “re-sell” when or if you no longer need it.